We often like to think that there is only one side to a story, the side we know and believe in. This is rarely true, and into today's picture book we see how the same story can be very different depending on who is telling that story. Children will be amused by this tale, and hopefully they will also take something away with them after they have read it. One day a little girl is walking home through the woods when she sees a peculiar little beast hanging from a tree. The little beast is “whining sadly,” so the little girl decides to “rescue” the little animal. She takes him home wrapped in her scarf, washes him, dresses him in a sweater and hat, and gives him a bowl of nuts to eat. She takes him for walks and shows him off to her friends. Then the little girl realizes that the little beast is not happy and soon after he runs away, returning to his home in the woods. One day, a little beast is happily hanging from a tree singing when he is “AMBUSHED by a terrible beast!” The beast ties it up, takes it to her “secret lair” and then proceeds to do unspeakable things to the little beast, things like bathing it, dressing it, and giving is stupid squirrel food to eat. Eventually the little beast comes up with a “cunning plan” and it escapes into the woods before its cruel captor can get her hands on him again. In this clever book the author tells us the same story from two points of view. First the little girl tells the story, and then the little beast tells the story. They both think the other is a “beast,” and they don’t think very highly of each other either. It is interesting to see how the little girl thinks she is saving the beast, whereas he thinks she is kidnapping, or rather beastnapping, him. Both the stories are funny, and together they will help children to see that there are always at least two sides to every story. The wonderful thing about both stories is that in the end the two beasts come to an understanding. They see things from slightly different perspectives to be sure, but the end result is a good one for both of them. Some children's poetry collections only really appeal, long term, to children. Some however, contain collections that adults also enjoy; they are books that can be shared and passed down from generation to generation. Today's poetry book is just such a title, and it would make a wonderful gift to a family. Many years ago, when Helen Ferris and her brother Fred were little, their parents made poetry “as much a part of their children’s every day as getting up in the morning.” Helen and Fred absorbed poetry, learning many of the poems they heard by heart. Their poetry journey began with Mother Goose rhymes, and went on to include the poems of Alfred Tennyson, Henry Wadsworth Longfellow and Shakespeare. Helen’s mother felt very strongly that even if her children “could not understand all the words,” they could still “enjoy the beautiful sound of them.” Helen and Fred and their parents moved several times, and their lives changed in many ways, but they never stopped enjoying poetry and sharing it with others. Many children will naturally gravitate to this latter section, for here they will find old favorites like The Walrus and the Carpenter and The Owl and the Pussycat. Here too is The Song of Mr. Toad, which is the song that Mr. Toad sings in The Wind in the Willows when he is feeling rather pleased with himself. Edward Lear and Ogden Nash’s nonsense poems are also here. Poems with a patriotic feel appear in the “Sign of my nation, great and strong,” section. Here children will find Paul Revere’s Ride, and The Gettysburg Address, along with The Star-Spangled Banner and America the Beautiful. This is the kind of collection that has something for everyone, no matter what the age of the reader. It is a book to grow old with, and a book to pass on to the next generation so that they too might grow up with a love of poetry, just as Helen Ferris did. We humans invest a great deal in the food that we eat. We enjoy trying cuisines from around the world, spend hours cooking meals, and love going out to eat in restaurants and diners. Food is often at the center of our holidays and celebrations. In today's poetry title you will find poems that are deliciously "Biteable," and that celebrate food in many creative ways. Spring begins in just a few days time. Here in Ashland we have already had a grand display of spring blossoms that began when the almond trees starting blooming a few weeks ago. Now the cherries are displaying their pretty pink blooms, and soon the crab apples will be starting. Today's picture book takes readers into the beautiful world of blossoming trees in spring. Finding ways to present old material in a fresh new way is something that some children's book authors and illustrators do very well. Jane Dyer is just such a person. In today's poetry title she brings together wonderful nursery rhymes and other poems for little children and pairs them with her own lovely artwork to give us a book that will delight the young and old alike. 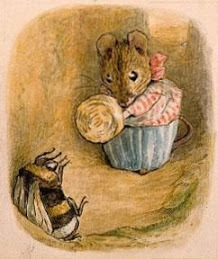 Many little children are captivated by the rhythms and rhymes in poetry, which is why so many nursery rhymes and other little sing-song poems have been written for them. Often they learn their letters using a poem, and their numbers and colors as well. They learn little stories for the first time, and connect with characters such as Humpty Dumpty, Peter Piper and Little Jack Horner. They learn to empathize with the characters who have a hard time, and laugh at the silly situations that they get into. In this charming picture book Jane Dyer pairs her warm, beautiful and often cozy paintings with some of the world’s most popular poetry for little children. There are poems for the nursery and the playroom, for bedtime and naptime, and for sick days and rainy days. The poems are divided into seven sections, and we begin with learning poems, such as One, Two Buckle my Shoe and A Apple Pie. Then we move onto poems about the seasons. The poem The Months of the Year takes us through the year with a series of rhyming stanzas, each one of which is paired with delightful little illustrations that capture the essence of that month. 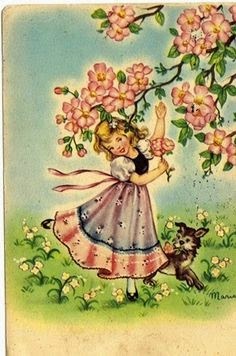 For example, we read about June, which “bring tulips, lilies and roses / Fills the children’s hands with posies,” and there, next to these two lines, is an illustration of three children, whose arms are overflowing with bouquets of flowers. The third section looks at food and drink, and here we find old favorites such as Hot Cross Buns, Pease Porrige Hot, and Polly Put the Kettle On, which many children like to sing together accompanied by the clapping of hands. We then go on to poems about animals, nursery rhymes, playtime, and finally wrap up with “Lullaby and Good Night” poems, all of which are perfect to share with a small tired child at the end of a day. Picture Book Monday with a review of Norman, Speak! When I was sixteen I found a little poodle mix on the streets of the town where I lived. He followed me home, and soon after he became a member of the family. At first I talked to the dog in Greek because we were living in a Greek speaking country. He did not respond to me at all and I thought that he wasn't very bright. Then we spoke to him in English and it became clear that he came from an English speaking household. He knew how to sit and stay and he was a proper little gentleman. In today's book you will meet a dog whom people make assumptions about, and it turns out that they are as wrong about their dog as I was about mine. When they get home the boy tries to teach Norman to sit, to come and to speak. He tries to teach Norman his own name, but the dog does not seem to understand a single thing the boy says and the boy starts to thing that Norman is a rather unintelligent animal. It does not really matter though, because the boy and his parents love Norman anyway. Then one day Norman and his master go to the dog park where they meet a friendly black dog. The black dog’s owner calls out and both Norman and the black dog go to him. When the man speaks to the two dogs they do exactly what he tells them to. The boy can hardly believe his eyes. He goes over to the man and realizes that he is not speaking English. The man explains that Norman understands Chinese! It turns out that Norman is smarter than anyone thought. In this charming picture book we meet a family that adopts a dog only to discover that their initial assessment of him was woefully incorrect. Their dog knows how to do all kind s of things and now they have to find a way to communicate with him. It is wonderful to see how hard they work to solve this problem and how things work out in the end. Children love noise words and noise sounds because they are funny. For today's poetry title I have a book that is jam packed with noise words. It is the kind of book that children find amusing, and they will love having the poems read to them again and again. The sun is rising and it is time to get up. With a “Riffle-rustle” a little boy jumps out of bed, his feet making a “down-pound” sound as they hit the wooden floor. Another day has “rolled around” and there are so many things to do. In this sounds-filled book of poetry we join some children as they make their way through the day from sunrise to sunset. Every page gives young readers little poems that are full of sounds and onomatopoeic words, many of which children will love. For example, in the second poem, Off to Breakfast, we encounter “sloppy slurp” and “Big Belch – BURP!” Later in the morning it is time to get dressed and we see a little boy “Twisty-Twiggle / Jump-up jiggle” as he gets his clothes on. After getting dressed we venture outside where we play in the grass, get kissed by a dog, do somersaults, look at the clouds, and enjoy doing the kinds of things that children love to do. By the time we are ready to go back indoors we are filthy and need to “Twisty-twiggle” into clean clothes again. Throughout this book the poems are accompanied by amusing illustrations that perfectly capture the ebullience of children as they make their way through the day having fun, playing, quarreling, and finally, resting. When I was young I did not fully appreciate what true bravery meant. Then I saw a friend do something that terrified him. He was afraid of heights and yet he climbed a tree to retrieve a wayward kite for someone else. I never forgot his courage and compassion. Today's book is about a beast who, though preferring a quiet life, goes into the frightening unknown to help others. This is a beast I would be happy to have as a friend. One day the Beast is having a relaxing bath in his lovely garden when he is interrupted by the arrival of a plane, which lands nearby. The pilot comes running up to the Beast and tells him that the people on his island need the Beast’s help. Apparently a loud and terrifying noise is coming from the middle of their island, and the residents are so frightened that they have left the island altogether. There must be “a truly ferocious monster” somewhere on the island and they want the Beast to help them get rid of it. Often we fear things that we don’t really understand because they seem overwhelmingly terrifying; but when we face them, we realize that they are not as bad as we thought. In this wonderfully amusing picture book, we see how the Beast, who is scared just like everyone else, finds the courage to face what frightens him, which is when he makes a rather surprising discovery. This is the second book about the Beast, and just like the first, it will delight young children and their grownups.